North Korean leader Kim Jong-Un had his defence minister executed with anti-aircraft fire for insubordination and dozing off during a formal military rally, South Korean intelligence said Wednesday, hinting at possible instability in the Pyongyang leadership. 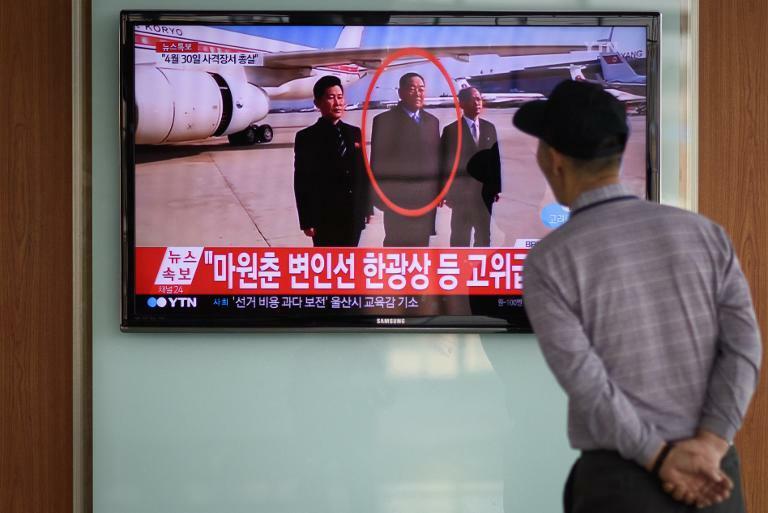 If confirmed, it marks another demonstration of Kim's ruthlessness in dealing with even the most senior officials suspected of disloyalty, following the execution of his uncle and one-time political mentor Jang Song-Thaek in 2013. It also points to possible power struggles within the top leadership, following Kim Jong-Un's decision to cancel a scheduled visit to Moscow last week in order to deal with "internal issues". Late last month, the South's National Intelligence Agency (NIS) reported that Kim had ordered the execution of 15 senior officials so far this year, including two vice ministers, for questioning his authority. 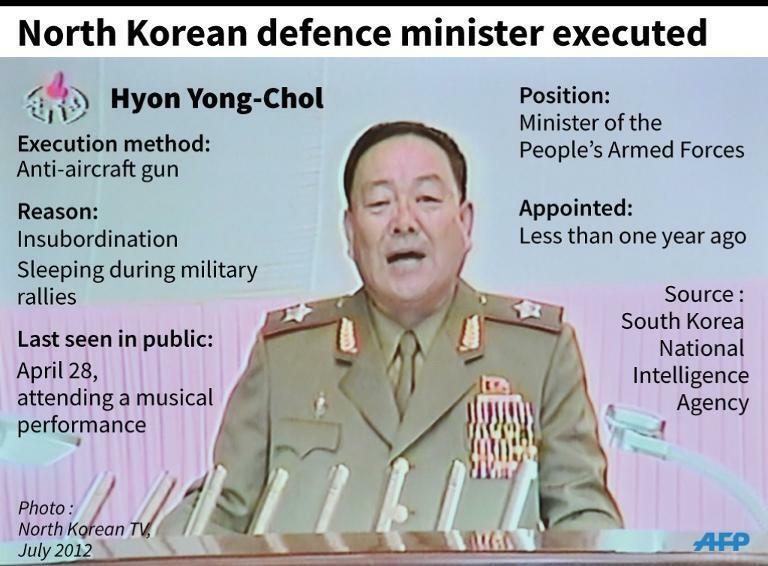 In a briefing Wednesday to a parliamentary committee, Han Ki-Beom, the deputy director of NIS, said hundreds of people witnessed the execution of defence minister Hyon Yong-Chol, which was believed to have been carried out around April 30 at a military academy in northern Pyongyang. Han told lawmakers that intelligence sources suggested Han was shot to pieces using an anti-aircraft gun firing 14.5mm calibre rounds. Such a violent method of execution has been cited in various unconfirmed reports as being reserved for senior officials who the leadership wishes to make examples of. Last month, the US-based Committee for Human Rights in Korea published an October-dated satellite image of the same academy that analysts said showed a shooting range with anti-aircraft guns lined up in what appeared to be preparation for an execution. Responding to the NIS report, Seoul's Unification Ministry said North Korea was under a "reign of terror" aimed at consolidating Kim Jong-Un's undisputed leadership. The details of the NIS briefing were relayed to local reporters by lawmakers who attended the parliamentary committee. The NIS told the committee that the minister had been arrested for expressing dissatisfaction with Kim's leadership, repeatedly ignoring his orders and dozing off during a rally that Kim presided over. Yang Moo-Jin, a professor at the University of North Korean Studies in Seoul, said Hyon's reported purge and execution were a shock. "Hyon was seen as one of the three closest military officials to Kim Jong-Un," Yang told AFP. Hyon had visited Russia in April -- partly to pave the way for Kim's scheduled trip to Moscow to attend a May 9 parade marking the 70th anniversary of the victory over Nazi Germany in World War II. Yang speculated that the minister might have botched his mission, amid reports that he had been tasked with brokering a weapons deal in return for Kim's presence at the Moscow event. 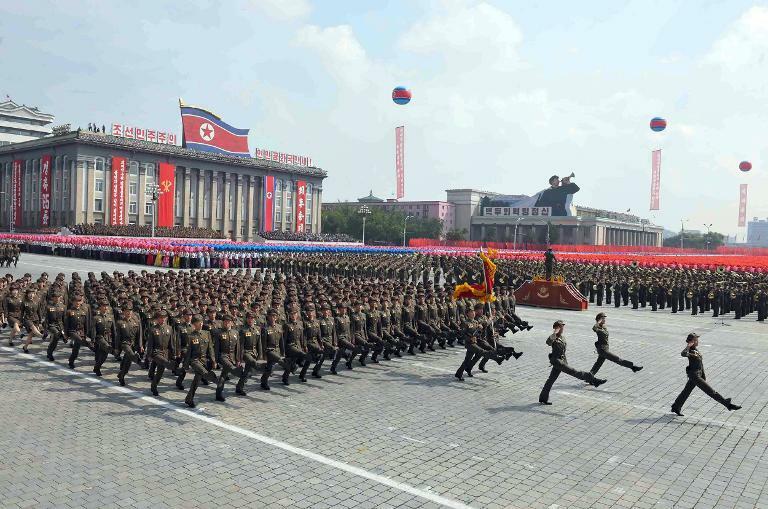 Kim cancelled his attendance just days before the parade, citing "internal North Korea issues". "An inexperienced leader like Kim can often display a tendency for overtly dramatic and brash moves... and for me the situation looks quite worrisome," Yang said. "It also suggests Kim is politically frustrated," he added. Since taking over power in North Korea following the death of his father, Kim Jong-Il, in December 2011, Kim Jong-Un has repeatedly reshuffled his senior military leaders. His most high-profile purge to date has been that of his once powerful uncle Jang Song-Thaek, who Kim condemned as "factionalist scum" following his execution. The NIS has a patchy record with its intelligence reports on North Korea, which have sometimes missed key events or reported others later revealed to be false. Cheong Seong-Chang, a senior analyst with the Sejong Institute think-tank in Seoul, said the NIS had been "rash" in reporting Hyon's execution on the basis of what he deemed "shaky, unconfirmed intelligence." "It needs to be verified, but is already being reported as fact by the media which only adds to the confusion," Cheong said.